Yesterday felt like a perfect storm of conditions that ultimately led to multiple skier triggered avalanches including two from my party and one fatality on Mount Washington. While it might seem odd to write about this experience so soon after it happened, I do so before memory forgets small details in the decision making of the day. It is my intention that sharing our day helps others understand some of the complexity and uncertainty when recreating in avalanche terrain, especially under a “Moderate” Danger Rating. Ben Mirkin and I pull into the Ammonoosuc Ravine Trailhead at the same time and find Benny Allen already waiting for us with ski boots on. The sky is “bluebird”, no wind, a couple inches of fresh snow sparkles bright in the morning sun. We greet each other warmly and conduct a departure check. All three of us have been back-country skiing for a combined total of 42 years. All three of us are climbing guides. All three of us our avalanche instructors, two certified level 3’s and one recently certified Pro 1. The thought occurs to me that many accidents happen to those who are experienced and possess a high level of technical proficiency. Green is our proposed up track, though we left from the USFS lot instead, red arrows were some potential options, yellow was a conservative decent choice, orange was our exit. The yellow shading uses digital elevation modeling (DEM) to highlight the aspects, angles, and elevations that the avalanche advisory mentioned human triggered avalanches could be “possible”. We break trail for 26 minutes and reach the junction of the Ammonoosuc Link Trail and continue up to Gem Pool in just under an hour. Benny and Ben transition to crampons and strap skis to their packs while I put on ski crampons and continue up the steeper grades. We reconnect above the steeps as we reach tree line and work our way to the AMC Lakes of the Clouds Hut in 2 hours 12 minutes from the car. At that point we do a weather observation and find it to be -10 degrees Celsius. It’s about 10:15 and winds on the ridge are a bit higher than expected. After a re-fuel break we set a course for Mount Monroe. Winds that were out of the Northwest shift to the North and are steady at 50 mph on the summit of nearby Mount Washington. Wind chills are around -15f. We confer in the lee just below the summit of Monroe. Our first objective was a steep couloir that drops off the ridge near Mount Franklin. While we could not see it from our current perch after consulting the map I felt we could transition and make it over to the top of the gully in less than 15 minutes. We de-skinned then dropped about 100 feet until we were around the shoulder that allowed us to get eyes on our proposed objective. During that short descent we attempted to test the wind slabs with no results. Franklin looked loaded, steep, and fun. We agreed to go check it out and be willing to reverse our route if we didn’t like what we saw. Traversing the ridge was windier than expected. We made it to the top of the proposed run and I started to get nervous. It was full of new wind effected snow. It looked steep. Light loading was still occurring. It was cold and uncomfortable and I felt like we might rush our decision. I could see my partners were a bit excited to grab this line. Acceptance was felt. I tried to picture the size of the avalanche we could trigger in this defined avalanche path. A choke mid-path just below a convexity would make this happen fast if we triggered this path. I pictured someone somersaulting through the choke-point. I even had a thought that an injured skier at the bottom of this run would need a helicopter, and that below ridge winds were light enough to get one. We had a rope with us, and the idea of a belayed slope cut was briefly mentioned. I spoke up and exercised my veto, and it was instantly respected. We transitioned back to skins and made our way back over to Monroe with plans on skiing a more south facing aspect into the same Franklin Brook Drainage. Winds started to drop as we reached another transition. We dropped the top 300 feet of the proposed run and found very firm conditions. No new snow had stuck to this aspect. The skiing was not good, and I suggested we cut our losses and head back up and over to get into Oakes Gulf, our conservative “Plan C”. I had skied a nice line in Oakes 5 days ago in a total white-out. The snow conditions were nice and I felt that aspect would hold the softest snow we would find on this side of the range. I was right and we dropped relatively low angle terrain from 5050 feet down to 4480 feet finding many decent turns along the way. As I reached Ben at the bottom of this pitch he relayed he just watched a size-able skier triggered avalanche just northeast of us, basically down the Dry River main drainage. We scanned the area and saw the skier exiting from near the bottom of the path that we estimated ran about 470 feet. I would later confirm from a closer witness this was a solo skier who was able to escape after triggering the slab and that the solo skier then regained the ridge and descended Hillman’s Highway. Here near the bottom of our run Ben suggested we transition and head back up and over to our exit route, Monroe Brook. I felt there were a few more good turns below us that could be managed. Benny wanted to finish the run. A 500 foot tight shot through a treed area was discussed. Ben gave it two ski cuts at the top and propagated a small slab 10 feet above him, about 15 feet wide and he was able to reach his targeted safer spot while we watched the small slide clear out the snow below. Now that the small slab was flushed out both Ben’s discussed descending the small path, but ultimately decided not to. I wasn’t keen on making steeper turns in the tight feature and voiced I would pop over to skier’s right into some wider and lower angle terrain and assumed we would meet up towards the bottom where the two features almost reconnect. As I moved over to the right, I scoped the area I had descended 5 days ago. Things looked good, I checked above me. The terrain steepened about 200 feet above me with a thin cliff band stretching about 450 across the slope. The slope I was about to drop onto was under 20 degrees. I decided to enter. I didn’t hear anything. I didn’t feel a collapse. I did look up and see the entire slope above me was failing. I had a little momentum bringing me more into the path of what was about to hit me and pointed my skis towards a spot just below a decent sized tree 5 feet ahead and hooked my right arm around it. I had about 4 seconds from when I saw the slide to when it hit. In that time I keyed the mic on my radio and said “Avalanche… coming down right on top of me”. I then locked my left arm around the tree and dug in. The debris hit the tree and me with some force. It felt like a surprise rogue wave while playing in the ocean, or trying to cross fast moving waist deep water. It pushed on me for about 5 seconds. Debris hitting the tree broke up and threw a little snow in the air giving me a moment of thinking I would be buried. The debris around me stopped moving and I watched a lot of snow travel down the path into the woods below. Another debris pile accumulated on the far side on another lower angle bench like the one I was on. I was buried to my waist but hadn’t budged from where I dug in. The debris set up like concrete. Benny and Ben where quickly coming into view having heard my radio call. “I’m not hurt, but I’m buried to my waist. I’m going to need help getting dug out”. Ben quickly scanned above me and determined there was little risk of another slide and both of them skied over to me and started digging. It took about 5 minutes to free me as my skis were still on. It took Ben A. saying “remote trigger” for it to really click. My first thought when I saw the slope fail was it was either a natural avalanche, which makes no sense given the conditions and avalanche bulletin for the day, or another skier above had triggered the slope (there was no one else in our immediate area). I had remotely triggered this avalanche from low angle terrain 200 feet below the crown line… the flanks however were quite long with the looker’s right hand flank extending to a point about 50 feet above me. This was a big slab. Using Caltopo, my GPS tracks, and what we saw after the avalanche I estimate the slide ran about 750 feet while descending about 385. The crown line was estimated to be 460 feet across, and up to a meter deep at it’s thickest, with most of it being between 15 and 30 cm. Slope angle at the crown was estimated to be 38-40 degrees. We transitioned back to skinning and made a plan to exit close to our descent track and well spaced out. We gained the ridge and made our way over to our exit route, Monroe Brook. Once in the upper gully we found a few inches of unconsolidated powder on a firm crust and made some enjoyable but sometimes variable turns down the run short pitching at first then leap-frogging our way down to the exit. Soon after getting back into the trees we heard a helicopter overhead traveling west to east. Given the conditions of the day we suspected this was from an avalanche involvement and hoped for the best. We had a lot of friends all over the mountain today. Back at the parking lot we started debriefing. As I mentioned at the start of this my radar was up based on our group make-up. For a three person team I couldn’t ask for better ski partners. I also think three person teams are ideal when going after the type of objectives we had on our agenda this day. We made some good calls. We agreed that if we had skied the Franklin gully it was “likely” we would have triggered it. There may be slight disagreement on how “escape-able” this path would be if it did go. There was talk of a belayed ski cut being the wrong choice considering we felt it was “likely” to slide and would leave behind a firm no fall type bed surface. The fact I thought about a helicopter being possible at the bottom of the run was clear evidence we needed to scale back, and we did. From that point on we avoided defined avalanche paths. We kept the angle pretty low. We committed to option B, and recognized the snow was not worth the effort, and switched to option C.
We ruled out Double Barrel as it has a very similar aspect/elevation/angle to the Franklin run that we had already turned our backs on. Our final option was in between the aspect that was a southeast aspect so we were actively avoiding the most likely east aspects. While we witnessed a size-able skier triggered slide on a nearby south aspect I believe we felt this relatively lower angle southeast aspect could be managed. When Ben suggested we transition and head out I could have jumped on board there. I was enticed to get a few more turns in despite my evening commitments keeping me on the tighter timeline. While I didn’t want to ski the tight ski shot on a firm bed surface I could have posted up and let the Benny and Ben get their steeper turns in. I traversed about 100 feet to the right to access open lower angled terrain and dropped just out of sight of my partners before triggering the slope above me. I don’t think I could have escaped given the terrain even through I was only on the edge of the path that ran. If I had gone past this tree without noticing the slide I would have been carried down the slope a couple hundred feet unless I hit a tree. We did not take the time to descend to the debris but without any doubt it was enough to completely bury someone. The lower angle bench I was on kept things less violent than being in the middle of the path would have been. “This could have easily happened to any of us” says Ben. “If you travel enough in avalanche terrain you are going to find avalanches” says Benny. You can remotely trigger a wind slab. I’ve known this is possible, but our avalanche problems and incidents in the east are almost always triggered from on the slab itself. You need to stay in visual contact. We had eyes on each other the entire day and broke that safe travel practice right at the end of our run. Radios are king. While they might have heard me if I yelled “avalanche” being able to convey what was happening clearly and quickly, then check back in after the avalanche and know they got the message was so reassuring. Travel with people you trust and have your back. I couldn’t have asked for two better ski partners to tour with this day! Bringing this whole experience into a whole other light is learning on the drive home that a solo skier less than two miles away was buried and injured in an avalanche. Reports then came in that stated that the victim died on scene after vigorous CPR attempts were made to revive him (he was estimated to be buried over an hour). Benny was worried it was a friend of his who hadn’t checked in yet and was suspected of touring in the area of the incident. Then, after 10 PM, I receive a text from Benny. With a heavy heart we learned the victim was indeed his friend. I’ll leave any other details or speculation until after the Mount Washington Avalanche Center releases their press release and accident report. I’m going to finish this long narrative with a personal thank you to everyone who has reached out to me with words of encouragement and support. News travels incredibly fast these days and our back-country ski community is pretty small and close-knit. We are all connected with only a degree or three of separation. I also share this personal story as timely as possible as we move into a busy couple of weeks on Mount Washington that historically are “stable” by Mount Washington standards. This winter has been extraordinary in snowfall amounts and late season cold temperatures. The general Spring skiing crowd needs to be aware that this is not a typical April on Washington by any means. Heads on a swivel, read the avalanche bulletin, don’t travel solo in high consequence terrain with out a clear understanding of what the outcome may be. My thoughts and prayers are with the victims family and his friends, especially my close friend, ski partner, and fellow avalanche educator, Benny, who lost a touring partner and friend on a day when despite the instabilities and risk we were all out doing what we loved. RIP Nicholas Benedix. I have triggered a lot of small avalanches over the 10 years I’ve been an avalanche educator. They have all been intentional, small, and inconsequential. Yesterday morning I triggered one that bordered on the line of consequential as it carried me about 20 feet down slope towards some uninviting looking trees. It was a fairly small avalanche with a crown that was estimated to be about 25 meters across the slope and 30 centimeters deep at its apex. I was high on the slab when it failed and able to self arrest with my ski poles in the bed surface quite quickly. While there were no injuries there is certainly something to learn from the experience so I’ll present the following account with that desire in mind. Earlier this season a new client hired me for a Backcountry Ski Skills Course. After getting a resume of ski descents and experience from him we conducted a skills course into the bottom of Hillman’s Highway and had a very successful day. A few weeks later he was back to take a 3-Day AIARE Avalanche Course and toured with me in the Gulf of Slides. Having vetted his ski ability and fitness we made a plan to ski from the summit of Mount Washington. Mother Nature however decided our plan to travel above tree-line on our day together would be unrealistic. After conveying that the summit was out for our day together he let me know he was still stoked to see how far we could go so we made a plan to head into Tuckerman Ravine and see if we could ski some of one of the renowned gullies located within. Low density snow yesterday has been affected by NW wind overnight which has produced relatively small new slabs that are possible to human trigger. After a quick re-fuel stop we made out way up the Little Headwall and observed some signs of instability on the slopes just above. Here the winds were full value and we tucked our heads down and pushed on to Connection Cache. We moved off the trail to the right to find a brief reprieve from the wind and don face masks and goggles before deciding to push a little further into the ravine. The winds were a little less brutal as we set a skin track up to the right of the Lobster Claw run out. We had observed enough active wind loading to rule out entering any of the major avalanche paths and a few hundred feet up the far right side of the ravine we decided it was time to transition and head back down. We dropped on some stiff wind board low angle terrain and I brought us down into the Cutler drainage then out to skier’s right aiming for the high exit that would connect us down to the far side of the Lower Snowfields. Here we traversed across a small steep slope one at a time before getting to the top of the chute that leads down to the flats then connects back out to the Cutler. The snow was a little punchy here but we could make a few good jump turns down about 50 feet. I posted up under a little tree island and had Fausto stop just above the island. A slightly lower angle open slope to skiers right looked like it would offer a few more turns before heading back into the drainage but it looked size-able enough to warrant caution. I told Fausto to stay put while I traversed over and onto this slope trying to stay high with the intention of ski cutting it and posting up on the far side. About halfway across the slope I saw it fail around me. There was no noticeable collapse or whumph but the cracks I saw everywhere in sight made it clear what was happening. I yelled “avalanche” as I started moving down hill and noted the crown was only 10 feet above me. I dug my ski poles into the bed surface and the little amount of debris that I was riding on continued downhill… I came to a stop about 20 feet below where I had triggered it. For a few seconds I watched the debris go down slope for about 100 feet through some small trees that I was glad I wasn’t meeting soon. Looking back uphill I could see Fausto was still in the spot I told him to stay and I instructed him to traverse over to me as there was no significant hang-fire left and I wanted him to join me on the bed surface. I shot some video and measured the slope angle, aspect, elevation, and position with the convenient Theodolite app. We then made our way down to the bottom of the run out for a couple more pics of the slide. The 13 cm of super low density (3.7%) snow that fell during an almost windless day on February 18th got introduced to severe winds over the evening hours and into the morning. As mentioned in the bulletin today “winds often allows us to exceed the 1:3-5 ratio of new snow to wind slab”. This new slab felt like it was probably 1-Finger to Pencil on the Hand Hardness Scale. I estimated the crown to be about 30cm deep at its apex. This small test slope is directly lee to the west winds that were howling all night and observed while we were in the area. In the video you can see active loading occurring directly following the avalanche. While this was my first “unintentional” triggered avalanche I don’t feel that I was completely caught off guard. Signs of instability along with expert opinion in the form of the avalanche bulletin guided our terrain choices and we stayed under 30 degrees and outside of major avalanche paths for good reason. We moved one at a time across suspect slopes and stopped where we could watch each other. I went onto the slope that failed half expecting to perhaps trigger a small slab and assumed I would be able to stay above it. I ended up taking a short some-what controlled ride 20 feet downslope while Fausto watched from a good vantage. With the benefit of hind-sight a more conservative choice would have been to descend skier’s left of the Little Headwall, basically down our skin track where we had already accessed slope stability. Assessing “top down” terrain is obviously harder to do. In speaking with one of the snow rangers my terrain choice was somewhat validated as a reasonable choice given the conditions. Still, I’ll be thinking about this day for quite awhile. Unintentional but somewhat expected is a strange way to think about triggering an avalanche, but that’s where I’m at right now. I hope sharing these details and thought processes with the community is beneficial. It doesn’t happen with out acute knowledge that my choices can be judged with different levels of objectivity. As an avalanche educator though I strongly believe we should learn from every single avalanche involvement and being able to share your experience in a clear and transparent fashion can only benefit the greater avalanche community. Snow, Avalanches, Reflection, and More Snow for MLK Weekend! Well that was an intense four day weekend of snow, snow, and more snow. It all started for me on Friday when I taught an AIARE Avalanche Rescue Course for Northeast Mountaineering. The timing of our first rescue course was somber as an avalanche accident made national news the evening before when two young men would die from being caught in an avalanche and many others injured in Taos Ski Valley, NM. My thoughts and prayers go out to the two young men, their families, and friends who have suffered this tragic loss. Friday’s rescue course brought 10 students from first year back-country travelers to seasoned vets who teach avalanche awareness classes for the Appalachian Mountain Club. We spent a couple hours in the morning going over rescue gear and methodology before moving to a field location for hands on realistic practice. Towards the end of the day I was partially buried a meter down in the snow while my friend and SOLO Instructor Sue addressed patient considerations, treatment, and evacuation. I thank former USFS Snow Ranger Jeff Lane for showing me the effectiveness of having students try to pull an unconscious 180 pound person out of a burial position. We ended the course just as the edges of an incoming Nor’easter brought some snow fall and by Saturday morning it was coming down steady! Saturday was the start of a three day AIARE Avalanche 1 Course and with my co-instructor Grant Price we had a full course of 12 students, all ski tourers with various levels of experience, but all eager to learn. After a productive morning of classroom and an afternoon of rescue practice I headed north to the AMC Pinkham Notch Visitor Center to present a Know Before You Go presentation. This one-hour program is designed for a broad audience to introduce the 5 steps of avoiding getting caught in an avalanche. In attendance were various guests, visitors, AMC trip leaders, and an AMC avalanche awareness class. After the presentation Q&A took us pretty late into the night. Driving home around 10 pm I got to see some of the heaviest rates of snowfall before waking early Sunday to get Day 2 of the avalanche course going. We spent a little time inside talking about Human Factors and Heuristic Traps, some of which I had quite recently let get the better of my own decision making, before jumping into some sweet online tools and creating a tour plan for the rest of the day. As soon as we hit the trail we started spotting obvious clues of unstable Storm Slab. Just as we were crossing the first Cutler River bridge we saw this… can you spot the two clues to unstable snow? We continued up to Hermit Lake and took a few minutes to poke in the snow near the Volunteer Ski Patrol Cabin. As we were close to our established turn around time we soon found ourselves enjoying some nice if not a bit bumpy turns down the Sherburne ski trail. On Monday, the final day of our avalanche course, our students started trip planning at the NEM Bunkhouse at 8 AM. The Mount Washington Avalanche Center was forecasting HIGH danger for the day. In addition the Mount Washington Observatory’s Higher Summits Forecast was predicting ambient air temperatures to plummet to the negative teens with wind chills in the -50 to -70 range. A conservative tour was needed, and the group selected a tour up the Cog Railway with a high point of Jacob’s Ladder and possibly a side trip over to the top of a new slide path. Using the incredible CalTopo website we created a tour map that highlighted areas that might harbor more risk. Yellow were aspects fully exposed to the hurricane force NW winds coming later that day. Red terrain fit the criteria of areas of HIGH danger, and orange represented some areas of CONSIDERABLE danger. We hit the trail close to 10 AM with a parking lot temperature of -9 Fahrenheit but surprisingly very low winds. The skin up to Waumbek tank took us just over an hour. During a break the group decided they would like to visit the top of the new slide path so we made our way up a few more hundred feet before contouring and bushwhacking over to the slide path. Here I could feel the Human Factors tugging hard. The snow looked great. No tracks in it! We hadn’t really seen any signs of unstable snow like we had the day before. No cracking or whumping. It wasn’t as windy as we thought it would be. We had time to ski it. It was cold but climbing back up it would really warm us up. I thought back to last weeks course when I had let Human Factors have a serious negative effect on my decision making. It was bluebird… no wind… perfect day to gain the ridge and complete a full “tour” on the last day of an avalanche class. The snow down here looked good… it must be good over there? Right? A student was apprehensive of her ability. Basically first time in the back country… My impaired objectivity reared its ugly head. “You can do it” I reassure without any evidence that she could. “We can side slip down until you feel comfortable making turns” I wrongly assumed. “It’s not that steep”… sure, for me, but what about her? Listen to Every Voice, Respect Every Veto. These are tenants in good back-country partners. Blue Sky Syndrome, Powder Fever, Over Confidence, and even some Kodak Courage had all crept into my consciousness. I failed to practice what I preach. I was not being objective. We made it down to the trail head just before dark. It took a few days and a formal debrief to really look back on that day for what it was. While I could call it a complete failure I’m looking at it as an ice cold head dunk of a wake-up call. 10 years of teaching these skills and I can still mess up. We all can. It’s how we move forward after making a mistake that counts. Back to the top of Phillip, we turn our backs on what might be a killer powder run and head back to the Cog. We enjoy great low angle riding in calf deep powder back to the parking lot. We’ve returned way ahead of our turn around time as we listened to each other when we admitted we were pretty cold. No one got frostbite. The ski down had warmed us up enough for a quick round of Compression Tests and an Extended Column Test on a nearby slope. We headed into the warmth of the AMC Thayer Hall for a tour debrief and to close the course. I handed out feedback forms that had been missing since the new curriculum rolled out. What did you get out of this course? How could the course be improved? Where did you feel most at risk or in danger? How can the instructors improve? At the end of the day I read through all 12 forms. Small changes can be made based on these suggestions. Small changes lead to better learning environments for students and growth for the instructors. I’m grateful for every comment and nudge from every student, fellow instructor, or guide I’ve ever gotten. Keep them coming. This past weekend I lead the first avalanche course of the season for Northeast Mountaineering, the relatively new AIARE Avalanche Rescue Course. This one day course is a excellent part of the new AIARE curriculum. AIARE Avalanche Rescue is a one-day stand alone course that is intended to be retaken on a regular basis in order to keep abreast of best practices in rescue techniques and gear. New participants will learn the basics of companion rescue, while returning participants will expand their skill set with advanced topics and realistic scenario practice to help improve their skills. Each participant will have the opportunity to receive professional coaching on their rescue skills, and will receive a rescue card acknowledging the completion date. AIARE Avalanche Rescue is a prerequisite for the AIARE 2 and Pro 1 courses. 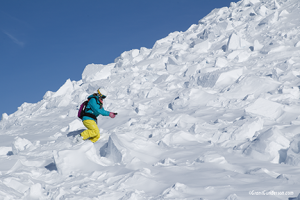 AIARE recommends that all backcountry travelers keep their skills current by taking an Avalanche Rescue course and receiving a rescue card at least every other year. The Avalanche Rescue Course is a one-day course aimed both at new and experienced recreational backcountry travelers and aspiring avalanche professionals. Describe what to do if they or a member of their party is caught in an avalanche. Identify and be able to use gear necessary for avalanche rescue. Set up a realistic scenario in order to practice an avalanche rescue response. Improve their response skills and times during and after the course with feedback from instructors and peers. Develop a plan for continuing practice. All students will have the opportunity to get feedback from an instructor on their rescue skills and timed practice in a realistic scenario. Students who have previously taken an AIARE 1 or an Avalanche Rescue Course will find value in having a professional help them set up realistic scenarios, practice skills in a realistic setting, receive feedback from an instructor, keep up with current best practices, and have an opportunity to practice advanced rescue skills. Students must be able to travel in the snow, and bring appropriate equipment for traveling on snow to class. There are no other prerequisites. *As space permits. Requires additional online reservation at The Bunkhouse. We only have two dates on the calendar so they will likely fill up soon! Please contact me directly with any questions or help booking the date at nealpinestart@gmail.com.